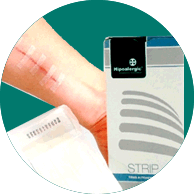 Highly permeable sterile skin closures, uniformly coated with an hypoallergenic pressure-sensitive adhesive. Safe, easy to apply, with less tissue trauma. Helps to avoid complications of scarring due to dehiscence of the incision. Recommended for use in joining edges of the skin in the closure of cuts and small surgical incisions or as reinforcement of suture clips. It can be used as a surgical suture replacement in emergencies and does not require anesthesia for its application.